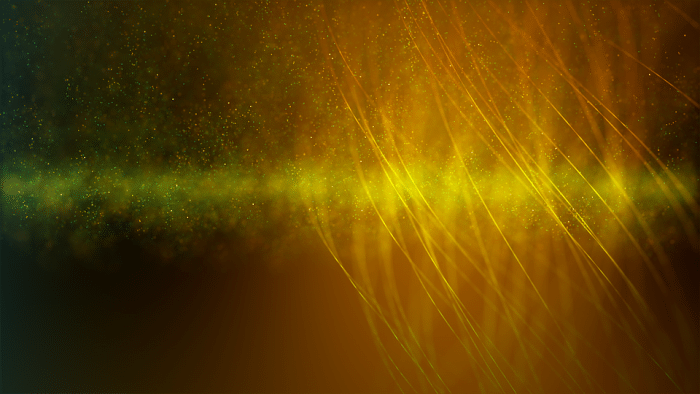 Gold, platinum and silver nanoparticles have received great attention from researchers due to their usefulness for the sustainability of the environment. 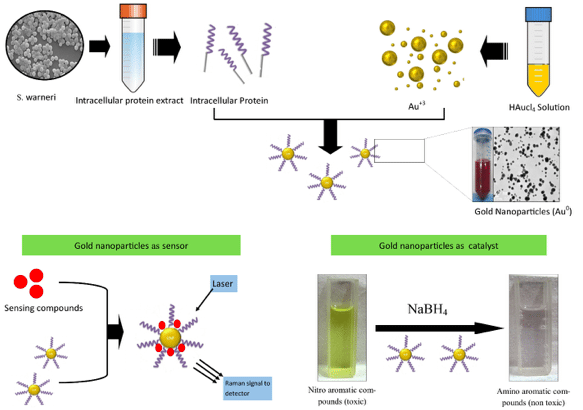 Among these noble metal nanoparticles, gold is the most important due to its higher biocompatibility, long-term stability, and resistance towards oxidation. Moreover, gold nanoparticles (GNPs) have found important applications in bioremediation and several other aspects in the industry. Apart from physical and chemical processes for synthesizing GNPs, microbial synthesis is very important since this process is clean, cost-effective, and eco-friendly in nature. We isolated a bacterial strain Staphylococcus warneri (SuMS_N03) from soil sediments of the estuarine mangroves of Sundarbans, a world heritage site, and we utilized the intracellular protein of this bacteria for synthesizing GNPs. To our knowledge, this is the first report to synthesize GNPs by using the strain Staphylococcus warneri, which has never been known for any bacterial function. These nanoparticles showed surface plasmon resonance peak at 535 nm. Transmission electron microscopic (TEM) and Scanning electron microscopic (SEM) analysis revealed the nanoparticles to be spherical and 15-25 nm in size. In this millennium, along with the industrial development and increasing urbanization, our environment is being exposed to an enormous amount of organic pollutants resulting in health damages. Among several water pollutants, nitroaromatic compounds are the most toxic ones. These are commonly used in the production of dyes, explosives, and pesticides in different industries. Being released into the environment, these compounds show serious carcinogenic and mutagenic threats not only to human health but to the whole ecosystem. The detection and disposal of these industrial pollutants are major challenges in the coming days for the sustenance of our environment. To explore the utility of the as-synthesized GNPs as an efficient nano-sensor substrate in the purpose of the detection of different pollutants, concentration-dependent measurement of Raman spectroscopy was performed, and this biosynthesized GNPs was found to be useful as a superior sensor for the ultrasensitive detection of different pollutants and toxic dye at a single molecular level. The as-synthesized GNPs were also utilized in catalytic applications, especially in cases of degrading nitro aromatic pollutants in industrial wastewater. Although several methods are available like ion exchange adsorption, filtration, chemical precipitation for eliminating these pollutants, they are not completely efficient. There is a strong requirement to detect and detoxify these toxic pollutants easily and quickly using an efficient novel catalytic agent. In our experiment, we observed that nitroaromatic compounds viz. 2 and 4-nitroaniline and 2 and 4-nitrophenol were completely degraded into non-toxic compounds in presence of trace amount of GNPs within a brief period of 10 min. Our GNPs show excellent catalytic activity with a significantly high rate in a recyclable manner. These findings are described in the article entitled Green-fabrication of gold nanomaterials using Staphylococcus warneri from Sundarbans estuary: An effective recyclable nano-catalyst for degrading nitro-aromatic pollutants, published in the journal Environmental Science and Pollution Research. This research is the outcome of a teamwork led by Sudip Nag, Arnab Pramanik, Dhrubajyoti Chattopadhyay, and Maitree Bhattacharyya from the Department of Biochemistry at the University of Calcutta, India. Maitree Bhattacharyya is working for the progress of scientific and societal interactions. She graduated from Presidency College with Honours in Physics and obtained M.Sc degree from the University of Calcutta. She started her research career in the Department of Biophysics and Molecular Biology, University of Calcutta with a PhD degree in 1991. She pursued research with a Research associateship from CSIR and in 1994 joined University of Calcutta as an Assistant Professor. Later, she was awarded a DBT Overseas fellowship and worked as Visiting Scientist in UCSD, USA. Now she is the Professor, Department of Biochemistry in University of Calcutta. Bhattacharyya joined as director at Jagadis Bose National Science Talent Search (JBNSTS), Kolkata from January 2015. Fourteen students have been awarded PhD degree under her supervision and in 2015 she is leading a group of ten research scholars which comprises PhD and post doctoral students. She has published several research articles and chapters in books of International repute. During 2016 Bhattacharyya has been bestowed the fellow of the West Bengal Academy of Science and Technology. Previous Post« Previous What Continent Is Egypt Officially In?